As you are reading this post, I assume that you are looking for an education loan or student loan for higher studies in India or abroad. Whatever may be the case in this post, I will help you to know everything about education loan or student loan. Education is the most powerful weapon which you can use to change the world. It is the passport for better future. Many parents dream that their child earns a higher education and graduate from the premium institute in India like IIMs, IITs and AIIMS. But with skyrocketing cost of higher education, very few can afford to fund higher education from own pocket. Majority of financial planner advice parents to plan separately for higher education. Many parents even invest their money in mutual funds, equity and fixed deposit for the child education. But regardless of all this, it may be possible that parents may face challenges to funding higher education of the child. An education loan is helping hand for the parents to fulfill their dream of providing higher education to children. Also Read – How to find Best Child Education Investment and Saving Plan? What is Education Loan or Student Loan? An Education Loan provides funds to the student for paying for university tuition, books, and living expenses. As this loan is given to student it is also known as a student loan. Almost every bank in India offers education loan to the student. However, features and benefits are different. This loan is given for funding education in India and even abroad. Who can apply for Education Loan? A Student can apply for education loan. Parents, spouse or sibling can be co-applicant. A student should have valid proof of securing admission in coursework, in India or abroad. A maximum amount offered for studies in India and abroad is different. It varies from bank to bank. What types of courses are covered under Education Loans? An Education loan can be taken for full time, part time and vocational courses conducted by AICTE/UGC approved universities. It includes Graduation, Post-Graduation, Diploma programs, Engineering courses, Management courses, Medical, Hotel management and other professional courses. The basic eligibility requirement for education loan is given below. The applicant must have completed higher secondary level schooling. The applicant of education loan must be Indian resident. He/she must have secured admission to recognized university and course that are covered under education loan. If loan applicant is NRI, he/she should have a valid Indian passport. Collateral or security enforceable in India has to be provided by the student (if applicable). The age of co-applicant should be minimum 21 years or above. Documents required for applying for education loan is given below. Margin money is an additional money student needs to pay from his/her own pocket for education, the remaining money is paid by the bank. Say if you are in need of loan amount 10 Lakh and a bank is ready to finance 90% of the loan (9 Lakh) remaining 1 Lakh you need to arrange by yourself. There is no margin money requirement for loan amount up to 4 Lakh. For loan above this amount, 5% margin is required for domestic studies and 15% margin for overseas study. The disbursement of education loan happens directly to the account of college/university based the on applicable fee structure. The interest rates of education loan vary from bank to bank. The interest rate range is 11.5%-15.1%. The repayment of loan starts after completion of course. Some bank provides an extension for six months to one year for starting repayment. The repayment period is 5 to 8 years. Prepayment and partial prepayment is allowed. A simple interest is charged during the course period. 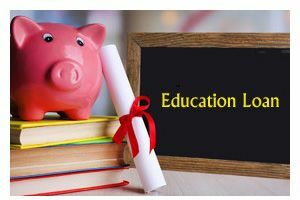 Section 80E is applicable for the education loan. The maximum amount deduction permissible under section 80E is Rs.1,50,000. This amount is over and above deduction allowed under section 80C. Please note that the principal amount repayment does not qualify for any deduction. Only interest paid on repayment is allowed for deduction. The deduction is allowed only for the individuals paying interest on the loan for himself, spouse or children. The deduction is allowed for maximum 8 years. Education loans are classified in various categories based on types of education and domestic or overseas studies. Student Loan for Overseas – For Higher education outside India. You should consider following points before taking education loan. Lookout for bank charges processing, pre-payment, and late payment. Compare interest rate applicable to the loan. Check for collateral requirement applicable to the loan. Look at margin money requirement for loan. Know income tax benefit applicable to education loan. Please note that Interest rate applicable to this types of loan is very high. Consider taking education loan if it is extremely necessary. Don’t opt for education loan just for income tax benefits. It is your first loan so, you have to be careful about repayment as your first credit score is dependent on this loan.